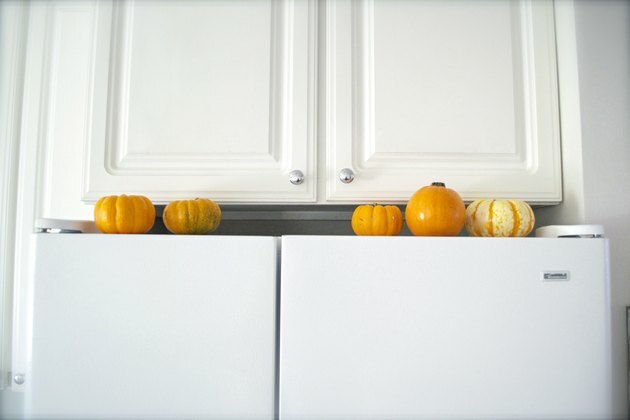 The appliances in your home may not be typical places to feature decorations, but adding decor to such areas as the top of your refrigerator will help improve the look of your room, as long as you remember to frequently dust the area. Because the height of the fridge makes its top barely visible for children and shorter people, the decorations should be tall and bold to stand out. Plants or fresh-cut flowers are often suitable for the top of a refrigerator, provided it doesn't get too hot to affect the vegetation. If the fridge does feel significantly hot to the touch, decorate the top of it with artificial flowers or plants. The plants or flowers you choose, living or fake, can match the kitchen's color scheme and also suit the season. Fresh tulips are ideal in the spring while holly works well in the winter. Depending on the height of the people in your home, the top of the refrigerator can be functional as well as decorative. Find a wicker basket or another style of receptacle that matches the home's decor and fill it with artificial fruit such as grapes, or fresh fruit if the space doesn't get too warm, provided household members can reach the basket. 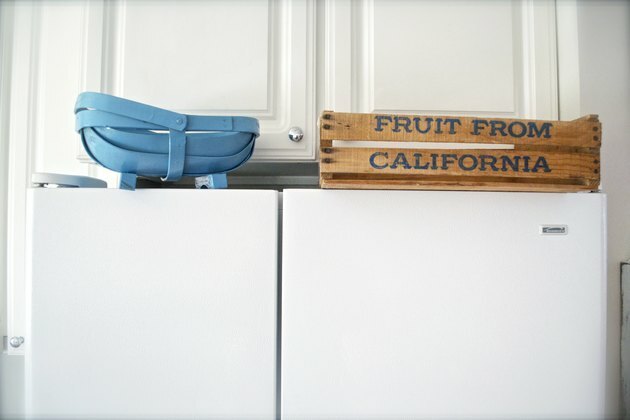 Storing fruit above the fridge is ideal for cramped kitchens as it frees up space on your counter or table. 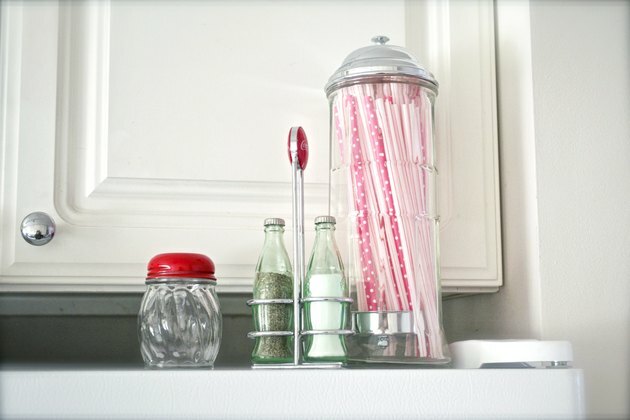 Decorative canisters may be used in place of baskets, stashing items such as tea bags, coffee or bottle openers. 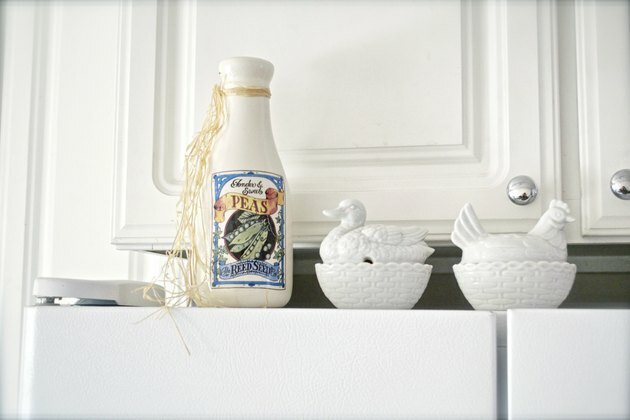 People who collect wine or other types of interesting bottles in a variety of shapes and sizes can display their finds on top of the fridge. This way, the collection is out of harm's way, but still within view. Antique colorful bottles, salt and pepper shakers or vintage food and spice tins add visual interest and a theme to the premium viewing space atop the refrigerator. The top of your fridge can be an additional place in your home to add decor that complements the general theme of your kitchen and rooms around it. Include elements such as vases, clay pots, photos, figurines, coffee mugs and anything else that suits the look of your kitchen. If you collect antique spoons, for example, you can display them in a rack on top of the refrigerator instead of using wall space. Picture frames display seasonal imagery, while a small chalkboard on a miniature easel provides space to leave a message to visitors and household members.